2013 was a year of transition for our company. We wished our long standing president, Mr. Glen Wilson, a happy retirement. We said the same to our out-going president in Tokyo, Mr. Seiji Omote. These two individuals are respected and admired by their peers in our company and industry. 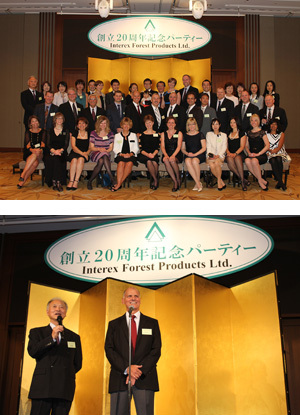 In recognition of these milestones for both Glen and Seiji, we invited them to address the guests (customers, government officials, family and friends alike) at our 20th Anniversary reception held at the Palace Hotel in downtown Tokyo. With over 220 respected guests in attendance, we welcomed our new president of our Tokyo office, Mr. Kazuya “Kevin” Minegishi. Kevin has worked at Interex, Japan since 1994. I had the pleasure of addressing our honoured guests and member company executives, representatives and spouses, giving a brief outline of our achievements since the inception of our company and our goals and objectives ahead of us. 2013 was truly a milestone in many respects: a record year for Interex, the retirement of two great leaders in Vancouver and Japan and the launch of the next generation of a sales and marketing team that is dedicated to the mills we represent and the customers we serve.